Her confirmation all but assured, Sonia Sotomayor pledged Monday to serve the "larger interest of impartial justice" rather than any narrow cause if she becomes the first Hispanic on the Supreme Court. 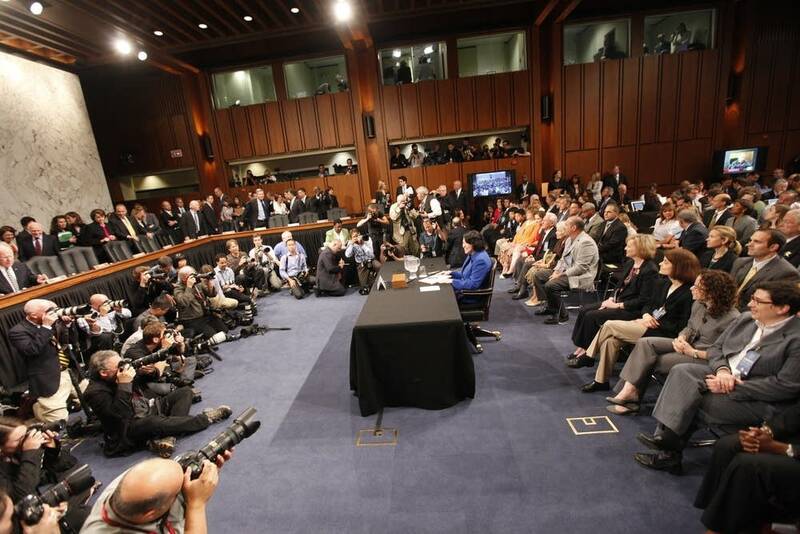 "My personal and professional experiences help me listen and understand, with the law always commanding the result in every case," Sotomayor told senators at a nationally televised confirmation hearing. The remarks about judicial philosophy were her first since President Barack Obama nominated the South Bronx-born and Ivy League-educated veteran of 17 years on the federal bench. They appeared aimed at Republicans who have questioned her commitment to impartiality in light of a 2001 remark that experience as a "wise Latina" might give her an advantage over white males. The 55-year-old appeals court judge spoke after several hours of speechmaking in which Democrats on the Senate Judiciary Committee praised her as a Hispanic pioneer well qualified for the high court and Republicans questioned her impartiality as well as President Barack Obama's views in nominating her. Despite GOP misgivings, Sen. Lindsey Graham, R-S.C., told Sotomayor, "Unless you have a complete meltdown, you're going to get confirmed." "And I don't think you will" have a meltdown, he added quickly as Sotomayor sat listening, her face in a half-smile. In her remarks, Sotomayor said, "The progression of my life has been uniquely American," that of a child of Puerto Rican parents who moved to New York during World War II. "I want to make one special note of thanks to my mom," she said. "I am here today because of her aspirations and sacrifices for my brother Juan and me." "Mom, I love that we are sharing this together," said Sotomayor, whose father died when she was 9. She turned as she spoke, whispering a thank-you to her mother, seated one row behind her in the packed hearing room. Sotomayor, who spoke for only about five minutes, returns on Tuesday to begin hours of questioning from committee members who will cast the first votes on her appointment. The role of racial politics in the day's proceedings became clear within minutes after Sen. Patrick Leahy, the committee chairman, rapped the opening gavel. "She's been a judge for all Americans. She'll be a justice for all Americans," said the Vermont Democrat. Leahy likened Sotomayor to other judicial pioneers, citing Thurgood Marshall, the first black justice, as well as Louis Brandeis, the first Jew, and Sandra Day O'Connor, the first woman. "Let no one demean this extraordinary woman," Leahy said in a warning to committee Republicans to tread lightly in the days ahead. Sen. Jeff Sessions of Alabama, the senior Republican, vowed a "respectful tone" and "maybe some disagreements" when lawmakers begin questioning Sotomayor on Tuesday. Moments later, he took aim at Sotomayor's 2001 statement that her standing as a "wise Latina woman" would sometimes allow her to reach a better decision than a white male. "I will not vote for, and no senator should vote for an individual nominated by any president who believes it is acceptable for a judge to allow their own personal background, gender, prejudices or sympathies to sway their decision," he said. "Call it empathy, call it prejudice or call it sympathy, but whatever it is, it's not law," Sessions said. "In truth, it's more akin to politics, and politics has no place in the courtroom." That was a reference to Obama's declaration - made before he named Sotomayor - that he wanted a person of empathy on the high court. Sen. Sheldon Whitehouse, D-R.I., made a spirited rebuttal later in the morning. "The empathy that President Obama saw in you has a constitutionally proper place" in the judiciary," he said. Obama named Sotomayor, 55 and a child of the South Bronx, to replace retiring Justice David Souter. While Souter was appointed by President George H.W. Bush, a Republican, he became a reliable member of the court's liberal faction. Sotomayor, who has served 17 years as a federal judge, including 11 on the appeals court, listened silently for hours to the senators until her time to speak arrived. She was sworn in before reading her statement. Leahy and Sessions escorted her to her seat before the hearing began into the first Supreme Court nominee by a Democratic president in 15 years. Other Republicans tried to straddle competing political demands, noting the historical nature of the occasion - Hispanics are the fastest growing portion of the electorate - while trying to keep faith with the criticisms raised by conservatives. "I would hope every American is proud that a Hispanic woman has been nominated to sit on the Supreme Court," said Sen. Jon Kyl, R-Ariz. Moments later, he added, "From what she has said, she appears to believe that her role is not constrained to objectively decide who wins based on the weight of the law but who, in her opinion, should win." "The factors that will influence her decisions apparently include her gender and Latina heritage and foreign legal concepts that get her creative juices going," he said. "He argued that the test of a qualified judicial nominee is whether she can set aside her personal views" and decide cases on their merits, Hatch said. Hatch added, "But today, President Obama says that personal empathy is an essential ingredient in judicial decisions." Graham was the only senator of either party to touch openly on the underlying politics of the nomination. "The Hispanic element of this hearing is important, but ... this is mostly about liberal and conservative politics more than it is about anything else," he said. The most fertile ground for Republican questioning appears to be on race and ethnicity, focused on Sotomayor's "wise Latina" comment and a ruling on white firefighters from New Haven, Conn., who won their Supreme Court case last month. By a 5-4 vote last month, the high court agreed with the firefighters, who claimed they were denied promotions on account of their race after New Haven officials threw out test results because too few minorities did well. 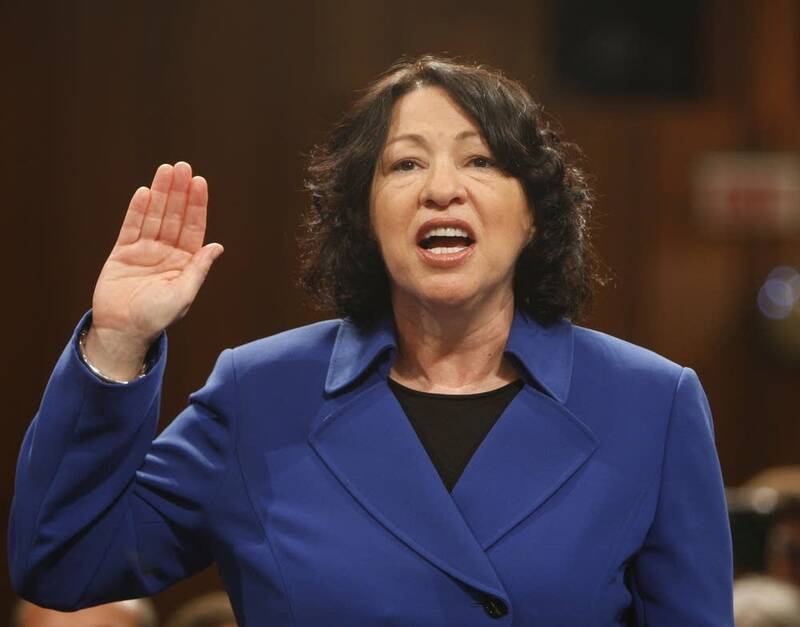 The court reversed a decision by a New York appeals court panel that included Sotomayor.